With regulation changes afoot at the start of every new Formula One season, it is with great anticipation when the first car breaks cover to give the press and public a tangible glimpse of what is to come. For 2019, it was the turn of Haas to launch first at the prestigious Royal Automobile Club in London’s Pall Mall, an unveiling attended by the world’s most influential motorsport press. 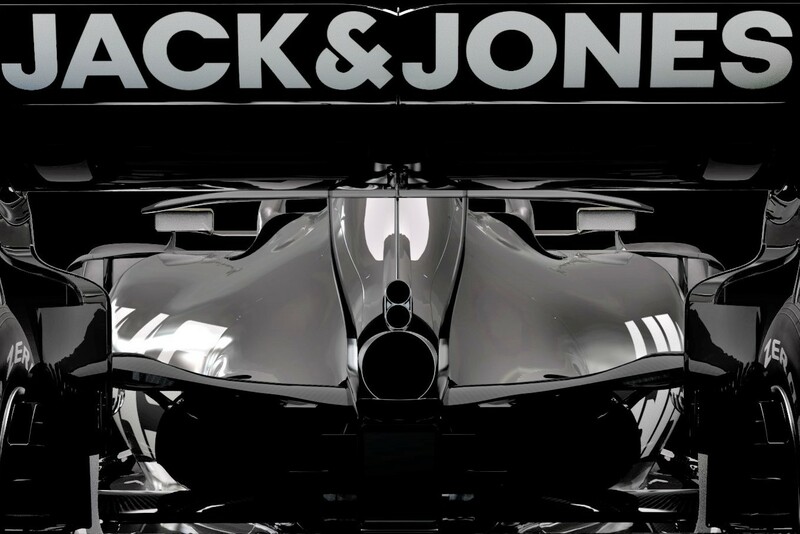 Haas launched its newly liveried car in two formats this week. 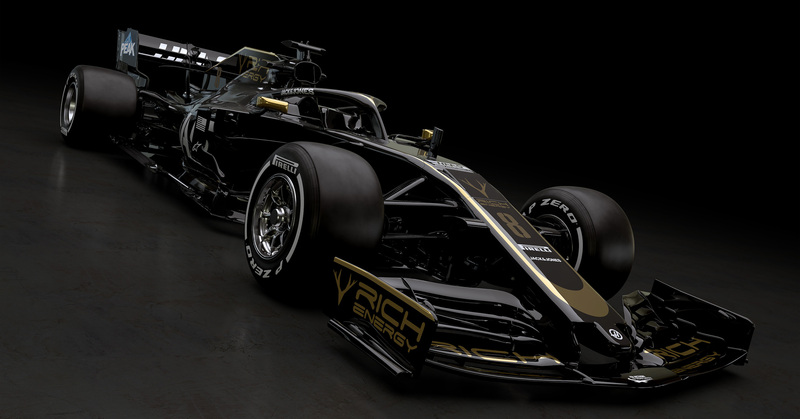 At the RAC event, there was the 2018 VF18 car, with a 2019 specification front wing fitted, while online there were renderings of the VF19. Combining details from both, we can start to glean some of the design elements of their new car. Haas remains unique in F1, as they follow the listed parts approach to creating their race car. This means that Haas designs and manufactures the minimum parts to be entered as a constructor. The Technical regulations set out these parts as the monocoque, crash structures and bodywork (which oddly includes the radiators). This means Haas takes the rest of the chassis parts and powertrain from a manufacturer, which has been Ferrari since the team’s inception in 2016. Additionally, it works with Dallara in Italy on its chassis and wind tunnel programme. This allows the team to be lean and focus on its aero programme, rather than having to design the thousands of other parts to run the car. Thus, Haas can be more focussed in creating what makes a fast car, rather than evolving effective and reliable parts that are not contributing to the car’s ultimate performance. 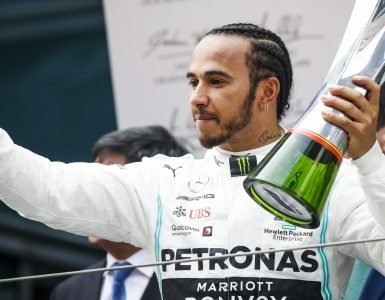 This has led to the team’s rapid rise and reaching fifth in the constructors’ championship in just their third season, albeit they are not gaining the knowledge to design these non-listed parts, which will be a handicap if they choose to enter as a full constructor in the future. 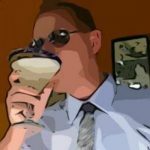 It needs to be pointed out that despite ill-informed media comments, Haas runs an independent programme to Ferrari where required by the regulations. So, whilst Haas will receive the CAD data from Ferrari on the parts it buys in, it runs separate staff and resources for its chassis and aero programme under FIA monitoring. Thus, the Haas is not a Ferrari copy, none of the bodywork design can be attributed to Ferrari, so they are quite independent in this regard. With the Ferrari non-listed parts link, Haas is somewhat tied to certain aspects of Ferrari chassis design. By taking the entire powertrain and suspension, the VF19 will be somewhat led to similar decisions on wheelbase and rake, as well as aspects of the power unit installation. 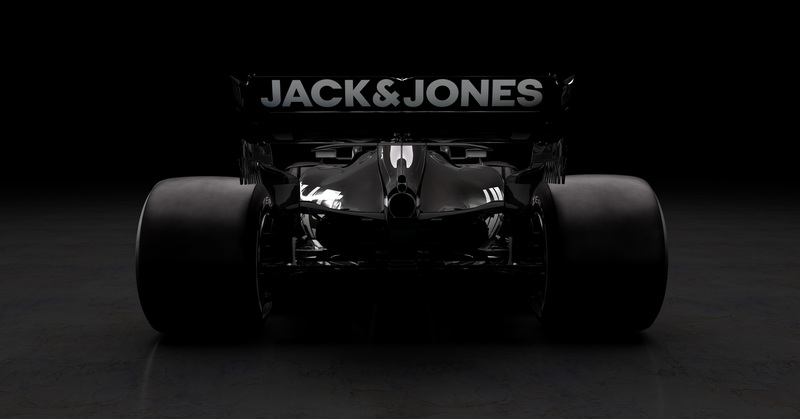 So, already we can draw conclusions to Ferrari’s new car, by looking at the Haas. It’s clear the already long wheelbase has not been extended and there’s no significant change in rake angle of the car relative to the track. 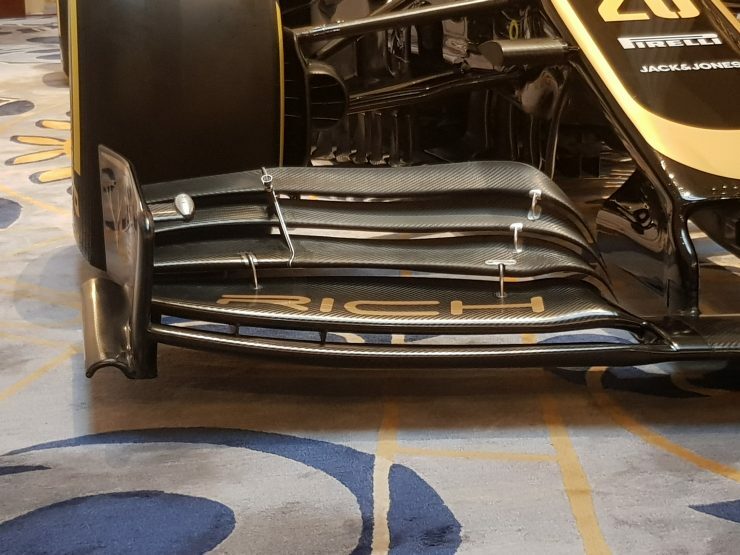 Looking at the physical car from the Launch event, the new for 2019 specification front wing is a real part, there’s little chance it would be a mock-up to trick people, albeit it will no doubt evolve over the testing period. 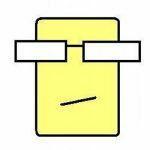 Thus, we can have some real analysis of its design. 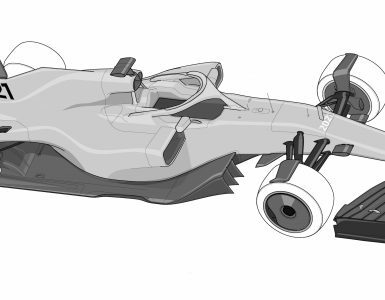 As explained in our Rules overview, front wings have been made larger and are required to be far simpler in design and complexity. The VF19 wing reflects these changes and represents a solid but simple approach to the new rules, which will be typical of all teams at their launch and in testing this year. There remain many tricks and loopholes to gain more performance from the front wing, so we will only see the real clever stuff either late in testing or at the first races. In detail, the Haas front wing uses the full five elements allowed, with each aerofoil profile spanning the full width of the wing. Although the wing profile and slot gap vary across the wing’s span, to get different effects from the different sections of wing, there is freedom in the wing geometry rules for the inner 150mm of wingspan. This is exploited by Haas to create angled inner tips to generate a strong Y250 vortex – this is the airflow that helps push the tyre wake away from the car’s central bodywork. The team has cleverly used small aluminum supports in this area, to be angled with the airflow to help the aero effect and separate it from the middle span of wing. This middle span forms the downforce-generating section of wing, three elements are adjustable for different downforce levels. Again, the rules allow a separator to be used and this plate between the adjustable section of wing and the fixed outer aerofoils is angled outwards to legally create a little outwash. The outer spans of the wing are sat ahead of the front tyre and are unable to be curved and twisted to the extreme outwash designs of recent years. Thus, these elements are flattened and use larger slot gaps, to reduce their effect. 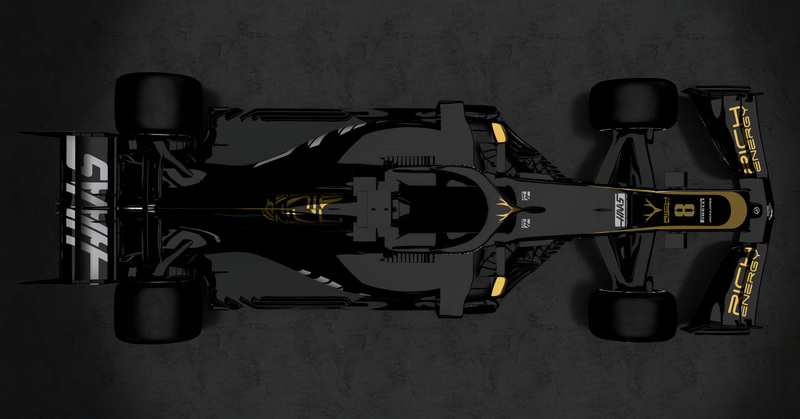 As with the wing profile, the endplate is also simplified this year. There’s less width to fit within and rules to prevent extremes of outwash angle. Haas has curved the endplate as much as the rules allow, but interestingly they stop the footplate before the end of the endplate. These coved footplates have been a feature of F1 for many years, they act to prevent high-pressure air going under the wing and create a vortex that runs outside of the front tyre, to prevent the air spilling off the tyre impinging on the wing’s airflow. By stopping the foot plate short they might be able to push this vortex out wider around the front tyre. 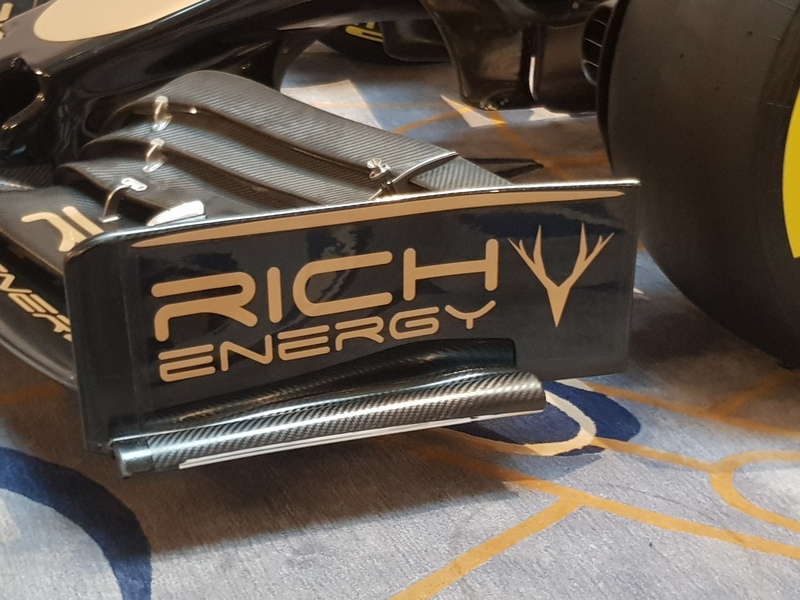 As we’ve seen on a Mercedes front wing teaser image, the tyre temperature sensor is fitted horizontally to the endplate rather than vertically to the front wing. The inclusion of this sensor was a late addition in the simplified regulations. The sensor scans the width of the tyre, to detect its temperature. This is critical for the team to understand the tyres and was a sensible addition to the rules. Of course, the minimal mounting that is allowed for the sensor can always be used for some advantage and Haas have also mounted there’s with a horizontal mounting. We now have to look towards the team’s renderings of the VF19 to understand more about the new car. Yet we have to be careful not to draw too many solid conclusions from these images, as of course, they are only a digital mock-up of the car. 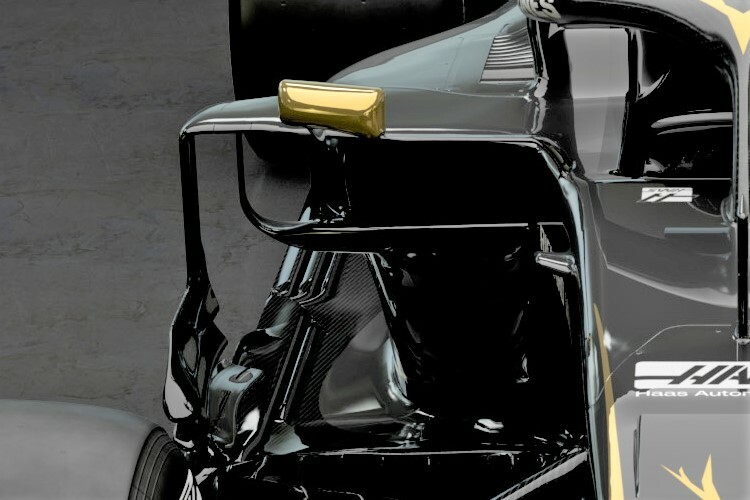 It’s easy to remove important details or add false ones, but typically these images released by teams tend to be fairly accurate, sometimes details were left in the rendering that were removed for the physical car launches. 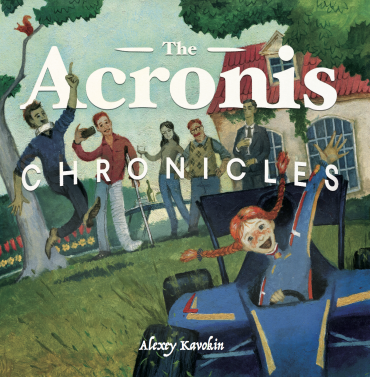 Reassuringly, the rendering features the same front wing as seen in London. Elsewhere, we can see the changes made for both rule changes and year-on-year updates. Haas has kept their thumb-tipped nose but added an S-duct inside it. 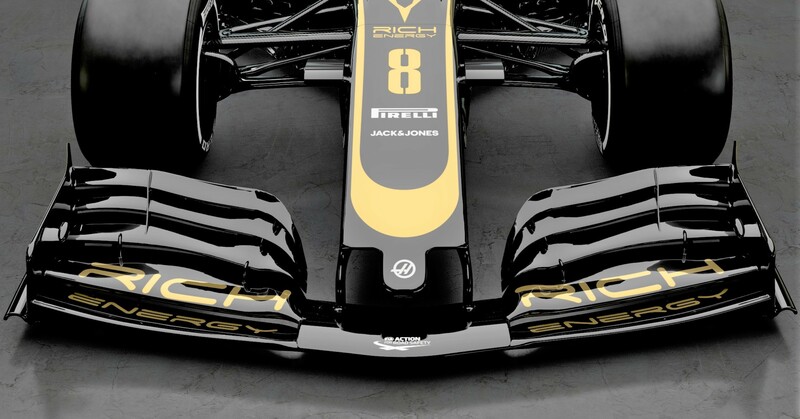 The exit duct for the S-duct can be seen on top at the join between the nose and chassis. The inlets feeding the duct below aren’t apparent, they’re hidden as it’s the important effect on the underside that the S-duct is used for, cleaning up the airflow that’s been squeezed between the front and nose tip. Also, like last season, is the front suspension layout, retaining a convention wishbone position rather than the high mounted set up pioneered by Toro Rosso and Mercedes. In a year where tyre management will be critical, its good to have stuck with a well-known suspension concept. Outboard of the wishbones the simpler front brake duct set up is apparent, but the detail of the inlet scoop will change race by race for cooling or aero benefits. If the inner brake duct is simpler, then the outer side of the brake ducts set up is likely to be very different. 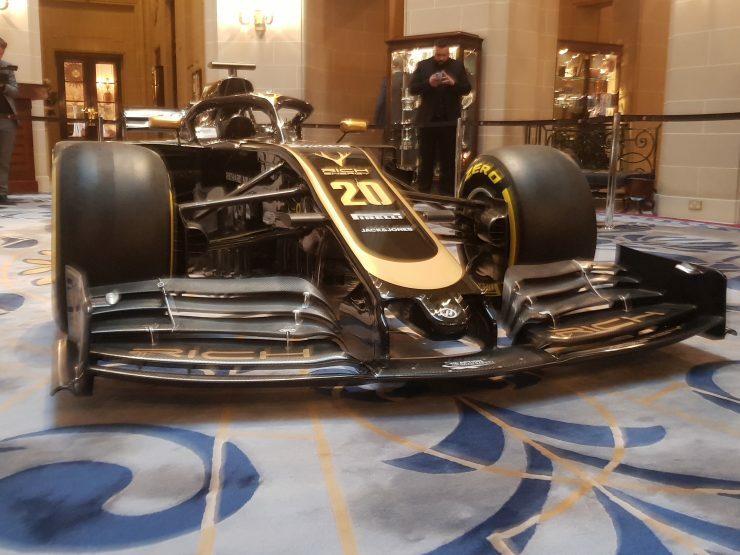 We can see the blown front axles from last year are now closed up, due to the change in rules, but other treatments have been added to regain the blown effect. The rule change only banned blown ducts in the middle 150mm diameter of the wheel. Many teams already blow ducts around the front brake disc and Haas appear to be exploiting this even more. We can see the wheel features an inner rim spaced a few millimeters from the outer rim. This suggests there are outer brake ducts blowing around the perimeter of the disc into this annular gap formed in the wheel. This should create some useful outwash lost by the rule changes to the blown axle and front wing. Like Red Bull and Williams, Haas followed the high inlet sidepod design last year. This rearranges the front of the sidepod bodywork and side impact crash protection to create a deeper undercut below the sidepod opening. It’s not that the revised sidepod specifically helps cooling but directs more airflow along the floor through the undercut, which in turn aids the diffuser’s performance. For the VF19 this design is cleaned up, with a simpler single cooling inlet. The rest of the sidepods are typically slimline and undercut, with no obvious tricks or improvements from last year hidden within. Cooling the radiators within the sidepods is aided with a new outlet duct formed in the headrest. There’s a clearly visible rear-facing outlet behind the cockpit, which can be used in addition to the usual louvers formed in the flat section of sidepod to the side of the cockpit. Above the sidepod inlet, a clever take on the wing mirror rules has been adopted. 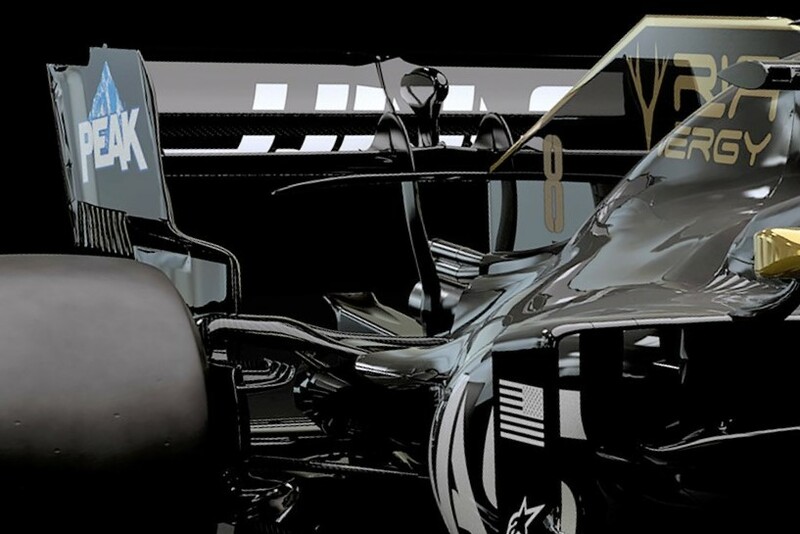 With just two mounts allowed for the mirror, Haas has used the inner mount to form a vane spanning all the way back to the cockpit opening. This will help direct airflow down over the sidepod tops. Outboard of the sidepod inlet, the vertical vanes (which were a feature of the 2018 car) have been revised. The forward upper section of these vanes must be lower, as part of the lower bargeboard rules. But Haas were still able to fit three aerofoil sections into this area. As well as creating outwash, these vanes also create some useful downforce in the middle of the car. A critical part of the Haas package is the Ferrari powertrain, as the team take the full bundle of power unit, gearbox and electronics. 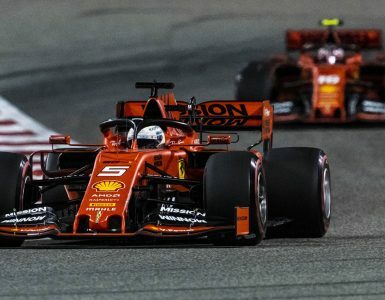 Clearly a powerful unit, the Ferrari package was also very reliable in 2018, both Haas drivers using just the three engines and two hybrid systems through the season. This relationship continues into 2019, with Ferrari’s updated PU and gearbox. Although no details have been released about the package at this stage, looking at the similarities of the engine cover and shark fin on the Haas between this year and last, there appears not to be fundamental change in the power unit’s layout. One power unit to chassis packaging detail that’s apparent on the VF19 is the exhaust arrangement, where the Haas has an unusual vertically stacked arrangement. F1 cars are required to have separate exhaust tailpipes for the turbocharger and the wastegate/s. This was to increase the sound after complaints of the cars being too quiet in 2014. Ferrari trialed this stacked arrangement in 2018 and it appears to be the preferred set up for 2019. Two small wastegate tailpipes are stacked above the main exhaust, which is most likely to be aerodynamic reasons. There’re two possible benefits. Firstly, the stacked arrangement makes the rear of the engine cover slimmer, the wastegate pipes not having to sweep out around the rear wing and suspension mounts, which perhaps usefully reduces heat transfer into these parts as well. 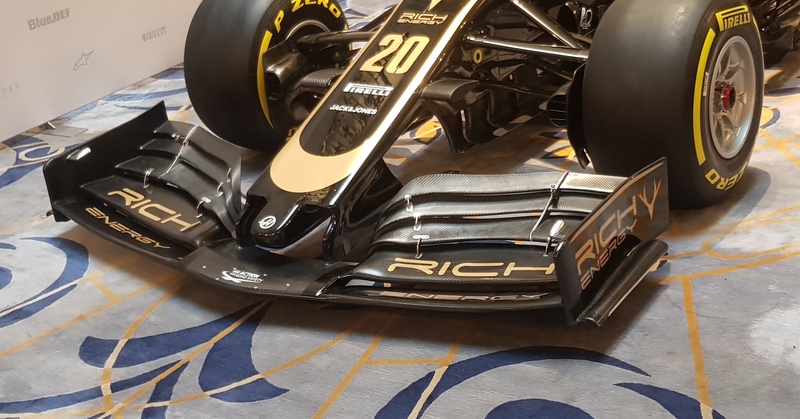 Secondly, the wastegate pipes could be used to blow the rear wing, which would be useful on corner entry, not natural time for the wastegates to be open, but an unusual engine mapping could be devised to exploit this. With the Higher rear wing and FIA looking to ban wing blowing, this seems a less likely choice. Two rear wing mounts continue to wrap around the exhausts to support the top rear wing, these pylons are now also used to support a T-wing that will aid the airflow under the top rear wing. The rear wing itself is, of course, the new wider, deeper and taller format, where the endplates no longer feature the drag reducing louvers in the top front corners. But the wing does follow McLaren’s much copied format of hanging vanes formed where the wing endplate is creased to fit between the rear tyres. These vanes aid the expansion of the airflow out behind the car, increasing downforce. 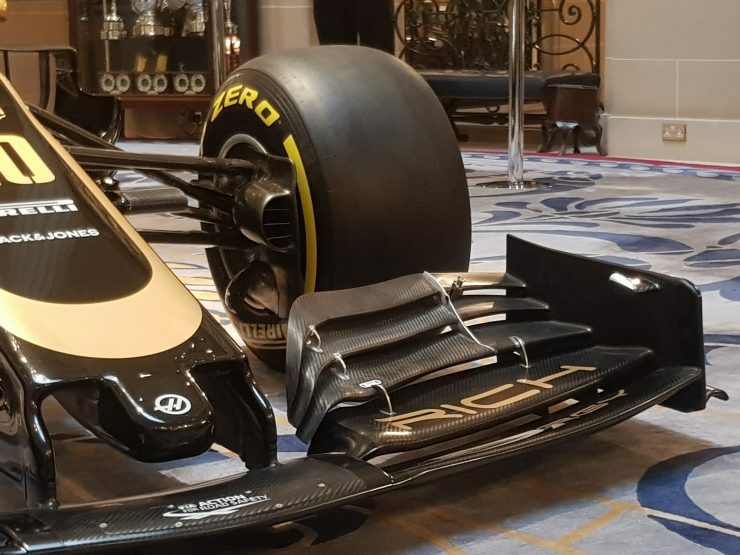 From the launch images alone, it’s hard to be certain, but the rear wheels appear to have the same inner rim treatment as the front wheels, for a brake duct-blown outwash effect. It’s noticeable the complete lack of rule changes applied to the rear brake ducts, with ever more complex vanes formed with the space allowed for this bodywork. Being the first unveiling, it’s hard to conclude where this leaves Haas in the grid’s competitive order. Bold claims of beating Red Bull were made at the launch, with what we’ve seen from the car and recent history, on sheer pace alone it’s hard to take these claims seriously. Certainly, the car is a step forward and exploits the new rules in some clever ways. However, it’s quite possible that Haas have matured enough to retain a front of the midfield position. They have a resurgent Williams and Racing Point (nee Force India) plus Renault to deal with. But in 2019 there’s tricky Pirelli tyres to cope with and the potential for Renault and Honda to have reliability issues, so this could be a strong season for Haas. Next into the breach is Williams and Toro Rosso on Monday, the rest of the grid to follow during the same week and Alfa Romeo Racing the following Monday.